As we head into the last week of spring training, with two official games already played, many things are still happening that could impact your fantasy lineup and worth noting if you have a draft still coming. The first advice I want to give you is do not get too overly excited about a pitcher winning the fifth spot in the rotation. I’ll be mentioning some of those pitchers here, but it should be noted that most of these pitchers will miss some starts during the season, many the first time around in the rotation. With off days scheduled, most managers will want to keep their top-four pitchers on regular rest. And most teams will be looking to limit the innings of these rising stars, so adjust accordingly. If your league allows reserves, they will be good to stash until they are used. 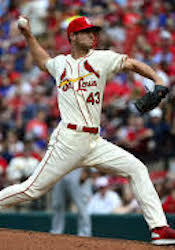 Dakota Hudson appears to have won the fifth spot in the Cardinal rotation, edging out John Gant. Hudson’s impressive spring featured 17 strikeouts and only four walks in 15 1/3 innings, and a 1.72 ERA. Atlanta might be looking for a couple arms for their starting staff due to injuries, and Max Fried has given notice he wants one. The fireballing southpaw threw five scoreless innings with seven strikeouts. If he gets the fifth spot, that start won’t be until April 7th. Luis Cessa kept his hopes alive for a Yankee spot with four scoreless innings and five strikeouts. A couple other starters had nice outings, giving notice they’re ready to go. Masahiro Tanaka threw five innings with seven strikeouts, giving him 20 strikeouts in 15 spring innings. Lance Lynn had nine strikeouts in five innings, lowering the Ranger starter ERA to 5.40. Nick Pivetta threw five innings with eight strikeouts, keeping the hype on the Philly starter going. A not-so-good outing in a minor league game by Alex Colome puts some doubt on his earning the closer job for the White Sox, 2/3 inning, four hits and two runs. His spring ERA is 4.76 in 6 games. Beware! Tough news for the A’s as rookie phenom Jesus Luzardo, who has been shut down with a muscle strain. Hoping to bounce back from ’16 Tommy John surgery, he’s probably out till at least June. Players looking to bat lead off, which means runs scored and stolen bases. Max Kepler for the Twins, Steven Duggar for the Giants, Leury Garcia for the White Sox (could change with Eloy Jimenez now expected to be on opening day roster) and Andrew McCutchen for the Phillies (lower your expectations for Cesar Hernandez). Nick Senzel stole his fourth base of the spring and continues to hit over .300, putting pressure on the Reds to award him their leadoff spot. Greg Bird hit his third spring homer, raising his average to .342 in his bid to earn the first base job in the Bronx. Luke Voit continues to rake, so the battle will continue next week. First base in KC is Ryan O’Hearn’s job to lose, and his 2-for-5 performance with two home runs and 6 RBI is a good sign of things to come. Jorge Soler looks to have a lock on the cleanup spot with five homers,15 RBI and .326 spring average. A good sign for the Dodgers was Corey Seager’s first spring homer, and manning the shortstop position. Another shortstop with a big spring is Jose Peraza. He leads the Reds with five stolen bases and a .394 average. If your league uses the stats from the two opening games in Japan, Seattle starter Marco Gonzales got the win with six innings and four strikeouts, giving up seven hits, a walk and three earned runs. Steve Strickland got saves in both games, pitching a perfect 9th in Game 1 and 12th in Game 2. Hitting stars were shortstop Tim Beckham (5-for-7, home run and two RBI), Domingo Santana with a grand slam, and Dee Gordon with a stolen base and run scored. For the A’s, Matt Chapman, Steve Piscotty and Kris Davis all went deep in Game 1. In Game 2, Yusei Kikucho’s MLB debut was blah, 4 2/3 innings, four hits, a walk, one earned run and three strikeouts. Mitch Haniger and Ryan Healy went deep for the Mariners, and Kris Davis drove in two more runs for the A’s, giving him four on the year. A’s closer Blake Treinen looked nasty in two innings of relief with four strikeouts. Charlie Wiegert was the sixth person to be inducted in the Fantasy Sports Hall Of Fame in 2001. He is a founder of CDM Fantasy Sports and Fantasy Sports Trade Association. He has been playing and winning fantasy baseball leagues since 1984. If you have any questions for Charlie, email them to cwiegert@cdmsports.com. Follow him on Twitter @GFFantasySports.